First, it’s been a while since I finished reading the first issue of a comic book and said out loud, “That was fun.” Brain Boy #1 met that exacting standard. Second, Brain Boy was actually an early-60s comic published by Dell, which Dark Horse has reimagined. Wikipedia has a little info about the title. And third, Brain Boy got a preview in Dark Horse Presents, Dark Horse’s fine monthly anthology series, and it impressed me. That story will be collected in a future issue, I understand, but it was on the strength of that story that I picked up this first issue. Anthology comics are good for something! 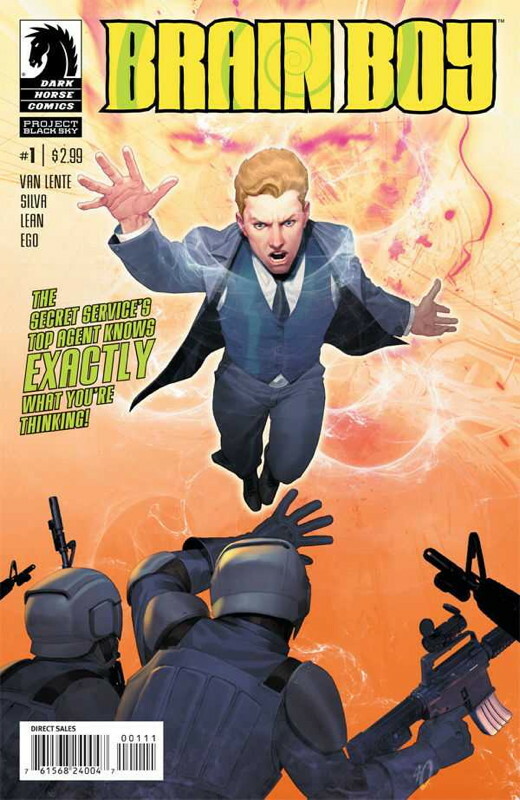 The title character is Matt Price, the world’s most powerful telepath (also a telekinetic). What do you do if you’re the world’s most powerful telepath? Raised by his parents’ employer after their deaths (hmmm), he now is “on loan” (?) to the Secret Service, where he works as part of the security detail on the most sensitive assignments. Oh, and he hates being called “Brain Boy”. How do you write a story about a man who can know what everyone around him is thinking? Perhaps taking a cue from Alfred Bester’s classic SF novel The Demolished Man (which is also about telepaths), figuring that out seems to be part of the challenge. Price is approached by a man who claims to be able to deliver information about his parents, but he doesn’t actually have it; he “knows a guy who knows a guy who knows a guy”, and while Price could track that guy down, it would take time and resources. Or, he can do a job he’s being asked to do, even though it goes against his orders, guarding a dictator who’s visiting the United Nations. Before the first issue is out, there’s a turn, followed by a last-page twist, in this first of a three-part story. Writer Fred Van Lente is perhaps best known for Incredible Hercules and Archer and Armstrong, both of which I would describe as “fun but light”. Brain Boy feels like it has the potential to be more substantive, especially if Price develops as a character (neither Hercules nor Archer are characters with a lot of development potential, albeit a lot of humor potential). Van Lente has a droll sense of humor, though it tends to result in a whimsical atmosphere rather than a lot of direct laughs. But he mixes in some hefty material here, as the story gets more serious throughout the issue, which is what the story will need to work. R.B. Silva’s art has a very modern look, and the layouts and finishes are both strong (abetted by a complex coloring job by “Ego”). Some of his figures are a little hard to read (especially the ones with any facial hair), so there’s room for improvement there. Overall it’s a very strong first issue. It takes place in the same universe as Dark Horse’s Captain Midnight revival (which is itself pretty good), but you don’t need to read that book to enjoy this one (and hopefully it will stay that way, as I’m pretty much done with crossovers at this point). While I could imagine the challenge of trying to keep coming up with clever ways to challenge Brain Boy might eventually wear thin, hopefully Van Lente can get at least a year’s worth of neat stories out of it.